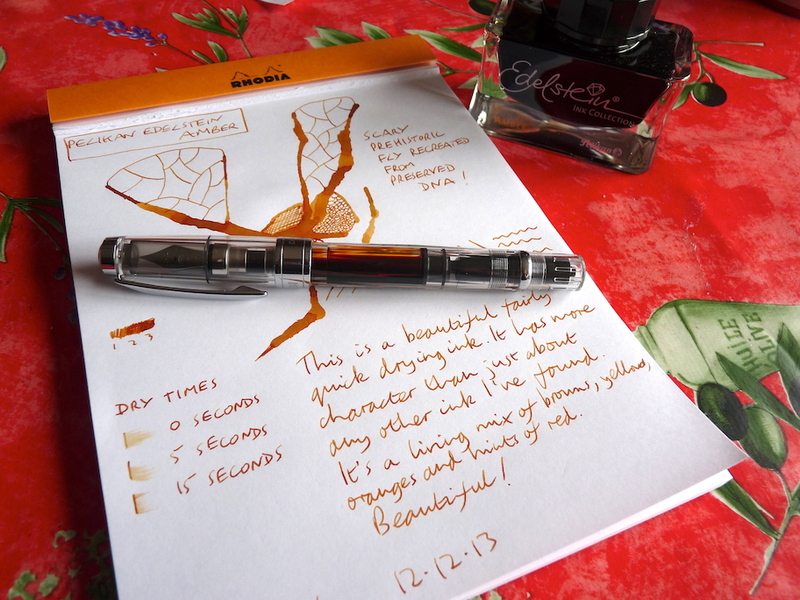 Pelikan Edelstein Amber ink review – Pens! Paper! Pencils! This is a lovely ink! How often do I say that? Rather a lot. I do like inks. I mean it every time though. Some inks are just a fundamentally beautiful colour and, to be honest, that’ll do it for me on its own. But others, like Pelikan Edelstein Amber for example, have character, have life to them. They’re more than just colour. Part of that is the packaging, I suppose, and the bottle this ink comes in is solid and well-designed and exudes luxury before you even put any ink in a pen. Once you do, the ink, although well-behaved in terms of dry time and flow, has a life of its own. The scan above is a fairly accurate representation of the colour, on my screen anyway. It’s not as orange as in the photo above. It is quite a flat colour but the shading lifts it in a completely gorgeous way. 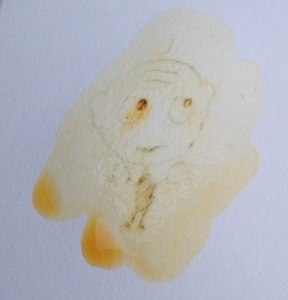 Jane asked, in the comments, if this ink was waterproof so I did a little test. I think it’s safe to say it isn’t. To be fair, it doesn’t claim to be either. Lovely! Is it a permanent ink, as in, can I brush watercolor over it and it will not bleed? Thanks! I tested this out and added a picture of the results to the review. It certainly isn’t permanent! Thanks for the question Jane. Thanks for the review Ian. I agree that bottle is like art! I almost want to sit it on a shelf. 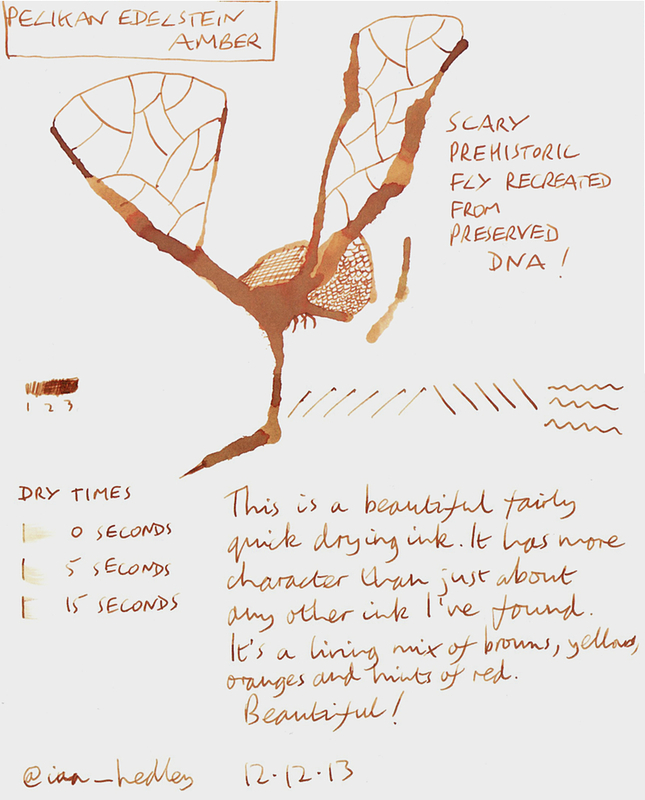 The ink color is a nice shade of orange variation. Not sure I have much need for another orange ink after ancient copper but I like this one. I do actually have it on a shelf! Ancient Copper is a very beautiful ink and very different to this. Room for both, I’d say! love it, thanks for sharing! btw, is it TWSBI 580?? Thanks for stopping by. Yes it is.